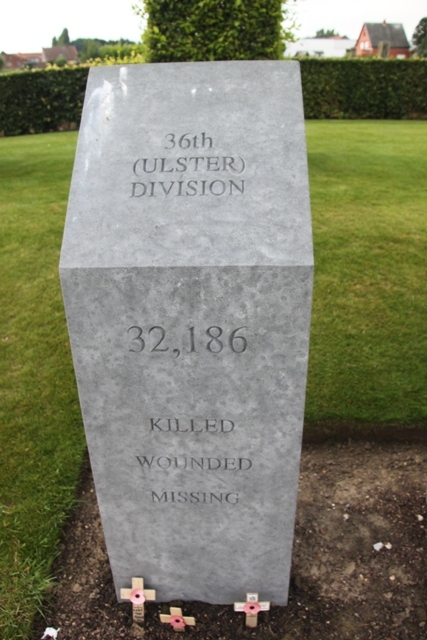 Our World War 1 expedition finished at the Irish Peace Park. Another place I hadn’t planned on visiting but with our Irish links and the proximity to Ypres decided we must. A bit tricky to find, right in the middle of the Belgian countryside but when the replica Irish tower loomed on the horizon we were sorted. The memorial is relatively modern, only unveiled on Remembrance Day 1998. The President of Ireland, Queen Elizabeth II and King Albert II of Belgium attended this ceremony. 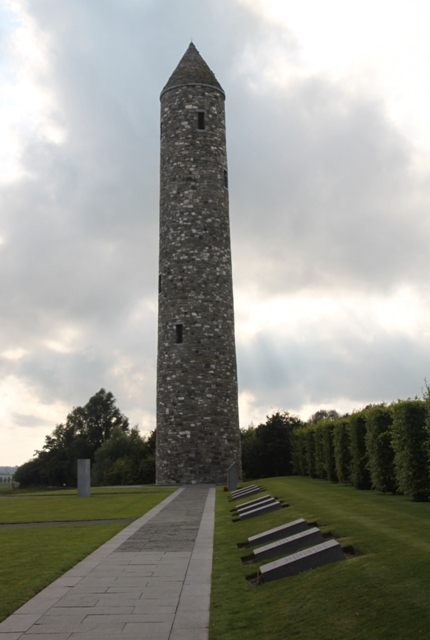 Close to the site of the Messines Ridge the location was chosen because that famous battle was one of the few where Irishmen, regardless of religion fought side by side against a common enemy. A beautiful and peaceful spot, it is dominated by that Irish round tower. 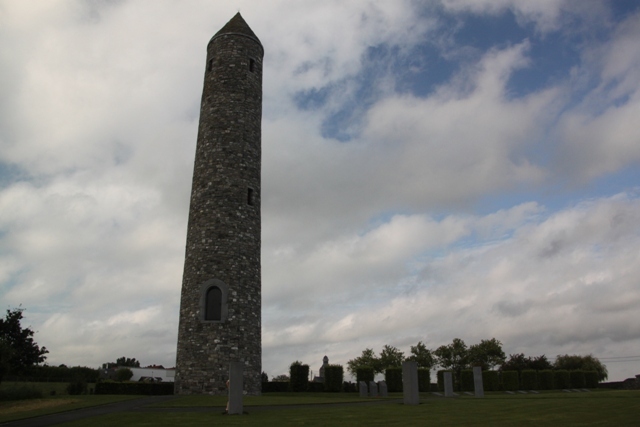 110 feet tall it is built from stone which came from a former British army barracks in Tipperary and a workhouse in Co Westmeath. The design means the sun only lights the inside on the 11th hour of the 11th day of the 11th month. 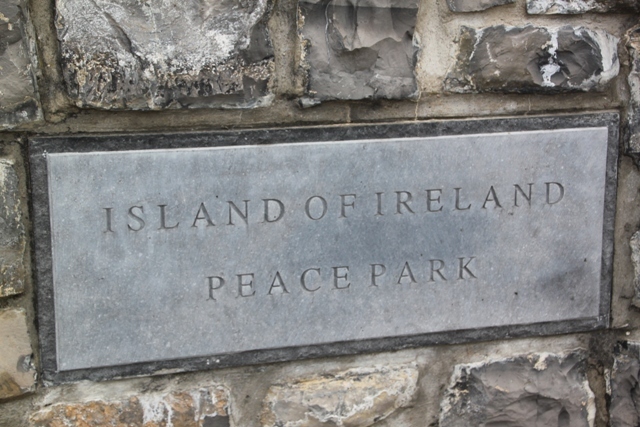 There are stone tablets along the walkway with quotations from Irish servicemen. Three pillars record the numbers killed and wounded. More of those sobering statistics. 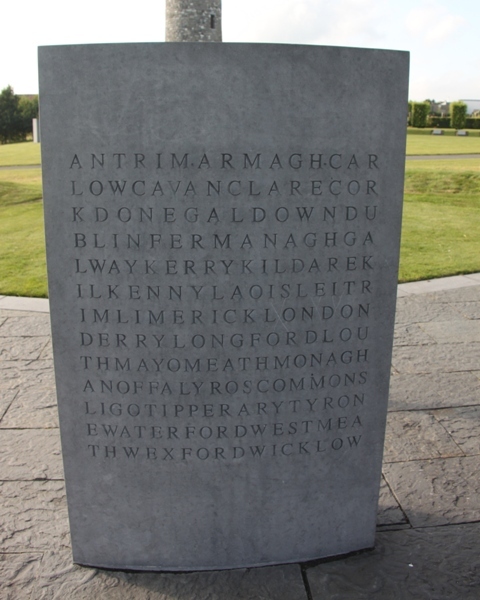 An inscription on the tower in Gaelic and English dedicates this place to all Irish soldiers of all political persuasions who fought and died in World War 1. A fitting tribute, we found it a reflective and moving place and that idea of peace and reconciliation in Ireland still strikes an important chord. 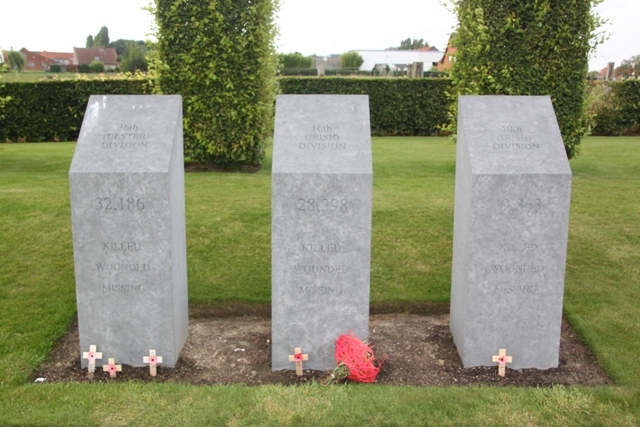 I’d love to tour European war fields and memorials. I really want to visit Bastogne, I’m a bit of a geek really! No problem with that – I am too James!! It’s been so interesting reading about your impromptu finds. That’s nuts that the light only shines on the 11 hour, 11 day etc. I can only imagine how emotionally exhausted you guys were! So clever to design something like that and it would be incredible to see the sun shine in on that particular moment. This was another of those wonderful places. Thank you!! It left a lasting impression on us. Beautiful, Joy. It really does look and feel so peaceful. It really was George, the perfect place to reflect and contemplate. That’s amazing that the tower was designed to only be lit on the inside by the sun on the 11th hour of the 11th day of the 11th month. There must have been some intense planning involved! I know, incredible how they can plan such a thing and then make sure it happens!! I just wish we’d been there at that precise time to see the sun shine in – that would have been a wow moment. What a beautiful memorial, that’s so interesting (and ingenious) that it can only be light at the anniversary of the war ending! Such a clever and wonderful idea, it really got to me!! It was such a good place to wind up our WW1 mini-tour Rosemary, different to the other battle sites and memorials but equally moving and special. Neat and touching place you found. The way the tower is lit is an amazing feat of engineering. It would be neat to see that I think. Isn’t it just incredible, it would be so moving to witness! It was special enough to just visit, but to see the sun come through, well …..